This healthy recipe was created by Gretchen Tseng of Veggie Grettie (I love that name! ), and shared with us by So Delicious Dairy Free. You can also visit So Delicious on Facebook (they often have coupon offers!). While the chocolate is melting, blend the tofu, coconut milk beverage, cacao powder, and stevia in a blender or food processor until very smooth. You may need to stop the machine a few times and scrape down the sides. Once the chocolate has melted, add it to the rest of the ingredients and blend until smooth, scraping down the sides as needed. The mixture will now be warm and the consistency of pudding. You can serve the dessert at this point as warm chocolate pudding, or you can chill it to make chocolate mousse. For mousse, pour the pudding into a glass container and store it in the refrigerator for several hours or overnight to firm up. Chocolate Cups: Dairy-free and vegan chocolate cups aren't an easy thing to find at stores, but you can easily make your own. 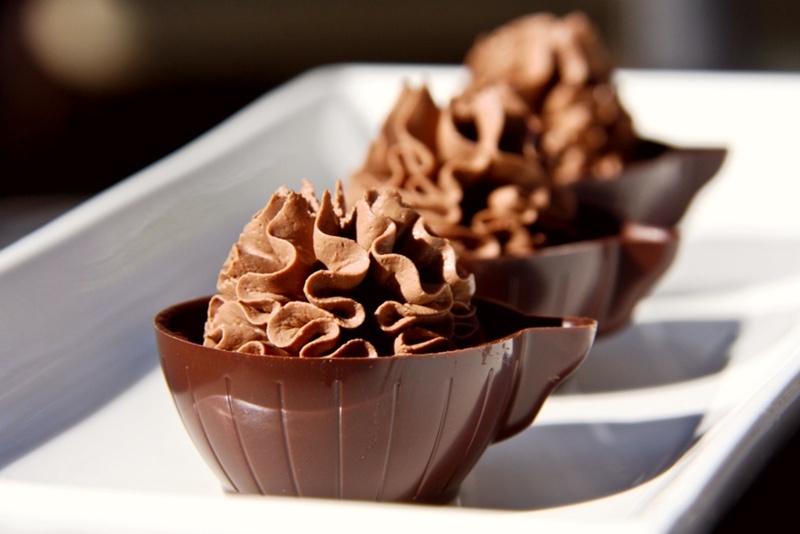 Simply follow these instructions for How to Make Chocolate Cups. They use cupcakes liners, but if you have silicone muffin cups or candy molds, then you can use those to make other shapes and sizes. Sweetener: Grettie keeps the sugar low with stevia (for another boost to heart health!). If you prefer a traditional sweetener, use about ¼ cup or to taste in place of the stevia packets.